Evan asks: When did the practice of burning books start? Burning of “Un-German” books. Berlin, Germany May 10, 1933. To a writer, a bookworm, or a believer in the freedom of press and knowledge, there is nothing quite as horrifying as hearing about piles of books getting eaten by flames, never to be read again, particularly in instances in history where some of the books being burned were extremely rare and since lost to us other than passing references in surviving works. Book burning is one of the most extreme forms of censorship, suppressing opposing views to religious and secular authorities by ceremoniously burning written text. Unfortunately, book burning has a long history and the practice is still very much alive today, despite the ironic nature of what it accomplishes now vs. in the past when the books in question were rare. One of the earliest references of an intentional “book” burning comes from a story in the Bible (Jeremiah 36) in which Jehoiakim, King of Judah, burns one of Jeremiah’s scrolls. The event supposedly happened in the 7th century B.C. It was the ninth month and the king was sitting in the winter apartment, with a fire burning in the firepot in front of him. Whenever Jehudi had read three or four columns of the scroll, the king cut them off with a scribe’s knife and threw them into the firepot, until the entire scroll was burned in the fire. The king and all his attendants who heard all these words showed no fear, nor did they tear their clothes. Even though Elnathan, Delaiah and Gemariah urged the king not to burn the scroll, he would not listen to them. Instead, the king commanded Jerahmeel, a son of the king, Seraiah son of Azriel and Shelemiah son of Abdeel to arrest Baruch the scribe and Jeremiah the prophet. In response, the Lord told Jeremiah to dictate the same words again and a new scroll was written. Of course, many would question whether or not this event actually happened, but either way it seems to be the first mention of an intentional “book” burning, even if you factor in the theorized edits that were made to the Book of Jeremiah over the next five centuries or so. However, with those edits (if adding in the part about burning scrolls was one of them), it’s possible that an event in China could usurp the title of “first”, but we can’t be sure. The first recorded book burning there was sponsored by the government and happened around 213 BC. So what was burned? Lots of things, but mainly Confucian books. Nearly every copy of Confucius’ books and related works were burned, save for one copy of each which was kept in the Chinese State Library, so that the knowledge at least wouldn’t be lost. It was simply dangerous knowledge for the public to have. Supposedly, the burning took place in conjunction with persecuting Confucians in an attempt to consolidate the Qin dynasty. The books were probably considered unsuitable for the public because of the political and social change proposed within them. Emperor Shi Huang even went as far as to bury alive many of the scholars who wrote the books so that their knowledge wouldn’t be replicated and those that might try would think twice about it given the fate the perhaps awaited them if they were discovered. This suppression of knowledge ended up being a little too effective. When the capital city was attacked in 207 BC, much of the imperial library was destroyed in a fire, resulting in a huge loss of human knowledge up to that point, including parts of the history of the region of present day China. The Bible itself is a book that was commonly burned throughout history as well. In one such case, William Tyndale printed the very first English translation of the Bible in 1526 and began distributing copies of it throughout England. This enraged the Bishop of London, who began to hunt down the new Bibles and destroy them. Soon, only two remained and Tyndale himself was burned at the stake in 1536. On the surface, the main issue the Catholic church had with the book was that elements of the translation were considered incorrect due to subtle meanings being lost in the conversion to English. Thus, Catholic officials believed that Tyndale’s translation promoted “heretical” and “anti-clerical” ideals. Of course, the much more pertinent issue was that the English edition made the Bible available to commoners who, if literate in English, would not need the church to interpret the scripture for them, as was often the case before. The church had recently had a major problem with this sort of thing when Martin Luther’s 95 thesis was translated from Latin and read to the masses. Rather than serving as fodder for internal discussions within the Catholic clergy as it was originally meant, the masses learned of it and took it to heart, quite literally revolting against many of the practices and dogmas of the Catholic church of the day because of it. Although there is significant evidence that Luther had not intended his thesis for mass-public consumption, he quickly became public enemy number one amongst the leaders of the Church when he refused to recant the points he made and even expanded on them, giving even more “heretical” ideas to the masses. The lesson learned here was that giving the masses more direct access to information the leaders of the Church had previously tightly filtered to suit their purposes wasn’t good for the corrupt elements of the church, which at the time was a good percentage of those at the top (though there were many bishops like Luther who lamented the corruption they saw and did what they could to fight against it). Book burnings continued throughout history, but one of the largest, most gut-wrenching book burnings happened shortly before World War II. 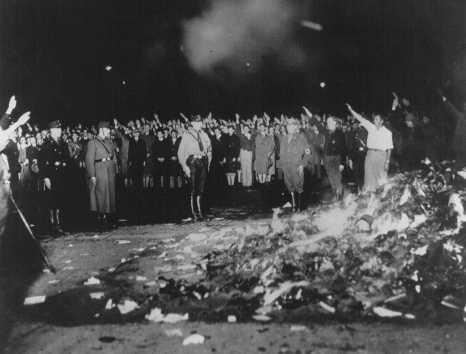 On May 10, 1933, over 25,000 books were burned by Nazi supporters. They aimed to create a “pure” Germany by making sure “arts and culture” parroted Nazi party goals. The burnings took place in chapters across Germany, largely headed by university students. Just over 30 German university towns took part in the “Action Against the Un-German Spirit,” burning books for their political ideals or “corrupting foreign influences.” Books by Jewish authors were obviously fed to the flames, along with books by Karl Marx, Ernest Hemingway, and Helen Keller, among others. Perhaps one of the of the more ironic and prophetic instances of books burned were those by Heinrich Heine, who once wrote, “Where they burn books, they will end in burning human beings.” His statement was proven not only in the case of Nazi Germany, but in many book burnings preceding it. Laws forbidding dissent do not prevent subversive activities; they merely drive them into more secret and more dangerous channels. Police states are not secure; their history is marked by successive purges, and growing concentration camps, as their governments strike out blindly in fear of violent revolt. Once a government is committed to the principle of silencing the voice of opposition, it has only one way to go, and that is down the path of increasingly repressive measures, until it becomes a source of terror to all its citizens and creates a country where everyone lives in fear. Today, book burning is still a frightfully popular way to show dislike of a particular text, even in simple fiction, rather than a book outlining some dangerous political ideal. Harry Potter books have been a common target for censorship since they obviously teach young children how to turn people into ferrets and worship the devil… Or, you know, entertain them and help cultivate of love of reading. There have been at least six major burnings of Harry Potter in the United States. For two Michigan pastors, T.D. Turner Sr. and T.D. Turner Jr., seeing a young girl “trying to perform a magic spell” was the last straw. Around fifty people watched them burn a Potter book outside of their non-denominational church in August 2003. The younger Turner admitted to never reading the books, which perhaps isn’t surprising. On the flipside of that, in an article I did here a few months back, there were a few people in the comments who claimed they liked to take the Gideon Bibles from hotel rooms and burn them. Given that this just results in the Bibles being replaced, thus profiting the Bible makers, this seems counter productive to what the Bible burners seem to be going for. And, in fact, that’s often the most fascinating part about modern book burning where burning a book doesn’t actually stop anyone from being able to get access to the text anymore, at least in developed regions of the world; it often just results in more copies of the thing being produced and sold, at the least because the people burning them usually have to go buy a copy to take part in the burning. Even more so when done on a large scale where the media picks up the event, which gets other people curious about the work. But I fully admit, we here at Today I Found Out, being extreme lovers of knowledge of all sorts, are more than a little biased on this one. We never met a piece of knowledge we weren’t glad to assimilate, even sad and horrifying bits, which at the least help us appreciate the sweet bits of life a little more. And things that challenge our beliefs… that’s just fodder for some great, civil, discussion and personal growth! We’ll leave off this one with a quote from famed Russian essayist, poet, and Nobel Prize winner (in literature), Iosif Aleksandrovich Brodsky, who incidentally was booted out of the Soviet Union in 1972 after years of butting heads with the state, including at one point being considered a “social parasite”, as writing poetry was not considered an accepted way to contribute to society. For this, he was exiled to the Arctic region of Arkhangelsk, where he was put to hard labor for a time before having his sentence commuted after 18 months. His opinion on book burnings? It is traditionally held that, upon suddenly taking ill, Virgil asked that his now classic work Aeneid be burned as he hadn’t had a chance to finish editing it. However, when Virgil died, Emperor Augustus supposedly ordered the work be spared. Whether this story is true or not is up for debate, particularly as the work doesn’t appear to contain the mistakes a rough draft work of this size should presumably have. Qin Shi Huang also brought us the Great Wall of China and the Terracotta Army. I guess if he couldn’t leave us valuable cultural texts, at least he left us some famous landmarks. In 2011, pastor Terry Jones called for the burning of the Koran on September 11th. He later called off the burning after receiving calls from world leaders imploring him not to do it, but went back on his word months later and burned a Koran away from the prying eyes of the media. News of the burning leaked out, and over 30 people died in Afghanistan during protests against the event. The king and all his attendants who heard all these words showed no fear, nor did they tear their clothes. It sounds like something was lost in translation there. I never attended a book burning, but if I ever do, very likely I won’t get the impulse of tearing my clothes off. Unless the fire is really hot, of course. Any idea what that passage actually means? @MarcoC: Just my own opinion without doing research on that particular quirk, but from places like the Bible when people are tearing their clothes, it often seems to be just a social cue demonstrating they are shocked or extremely upset by something, perhaps not unlike the modern practice of gasping when shocked at something or (just as curious from a modern perspective as the tearing the clothes quirk) the 19th century practice of women feigning fainting anything something even remotely shocking happened. The practice of the tearing of clothes in the bible days was to show greiving or remorse. It meant that someone had died, or that the person who tore their clothes either had done something wrong or were unclean ( think lepors).